The sliding filament theory explains the mechanism of muscle contraction based on muscle proteins that slide past each other to generate movement. It was independently introduced in 1954 by two research teams, one consisting of Andrew F. Huxley and Rolf Niedergerke from the University of Cambridge, and the other consisting of Hugh Huxley and Jean Hanson from the Massachusetts Institute of Technology. It was originally conceived by Hugh Huxley in 1953. Andrew Huxley and Niedergerke introduced it as a "very attractive" hypothesis. According to the sliding filament theory, the myosin (thick) filaments of muscle fibers slide past the actin (thin) filaments during muscle contraction, while the two groups of filaments remain at relatively constant length. Before the 1950s there were several competing theories on muscle contraction, including electrical attraction, protein folding, and protein modification. The novel theory directly introduced a new concept called cross-bridge theory (classically swinging cross-bridge, now mostly referred to as cross-bridge cycle) which explains the molecular mechanism of sliding filament. Cross-bridge theory states that actin and myosin form a protein complex (classically called actomyosin) by attachment of myosin head on the actin filament, thereby forming a sort of cross-bridge between the two filaments. These two complementary hypotheses turned out to be the correct description, and became a universally accepted explanation of the mechanism of muscle movement. The first muscle protein discovered was myosin by a German scientist Willy Kühne, who extracted and named it in 1864. In 1939 a Russian husband and wife team Vladimir Alexandrovich Engelhardt and Militsa Nikolaevna Lyubimova discovered that myosin had an enzymatic (called ATPase) property that can breakdown ATP to release energy. Albert Szent-Györgyi, a Hungarian physiologist, turned his focus on muscle physiology after winning the Nobel Prize in Physiology or Medicine in 1937 for his works on vitamin C and fumaric acid. He demonstrated in 1942 that ATP was the source of energy for muscle contraction. He actually observed that muscle fibres containing myosin B shortened in the presence of ATP, but not with myosin A, the experience which he later described as "perhaps the most thrilling moment of my life." With Brunó Ferenc Straub, he soon found that myosin B was associated with another protein, which they called actin, while myosin A was not. Straub purified actin in 1942, and Szent-Györgyi purified myosin A in 1943. It became apparent that myosin B was a combination of myosin A and actin, so that myosin A retained the original name, whereas they renamed myosin B as actomyosin. By the end of the 1940s Szent-Györgyi's team had postulated with evidence that contraction of actomyosin was equivalent to muscle contraction as a whole. But the notion was generally opposed, even from the likes of Nobel laureates such as Otto Fritz Meyerhof and Archibald Hill, who adhered to the prevailing dogma that myosin was a structural protein and not a functional enzyme. However, in one of his last contributions to muscle research, Szent-Györgyi demonstrated that actomyosin driven by ATP was the basic principle of muscle contraction. "… [I]f it is postulated that stretching of the muscle takes place, not by an extension of the filaments, but by a process in which the two sets of filaments slide [emphasis added] past each other; extensibility will then be inhibited if the myosin and actin are linked together." Later, in 1996, Huxley regretted that he should have included Hanson in the formulation of his theory because it was based on their collaborative work. Andrew Huxley, whom Alan Hodgkin described as "wizard with scientific apparatus", had just discovered the mechanism of the nerve impulse (action potential) transmission (for which he and Hodgkin later won the Nobel Prize in Physiology or Medicine in 1963) in 1949 using his own design of voltage clamp, and was looking for an associate who could properly dissect out muscle fibres. Upon recommendation of a close friend Robert Stämpfli, a German physician Rolf Niedergerke joined him at the University of Cambridge in 1952. By then he realised that the conventionally used phase contrast microscope was not suitable for fine structures of muscle fibres, and thus developed his own interference microscope. Between March 1953 and January 1954 they executed their research. Huxley recollected that at the time the only person who ever thought of sliding filaments before 1953 was Dorothy Hodgkin (later winner of the 1964 Nobel Prize in Chemistry). He spent the summer of 1953 at Marine Biological Laboratory at Woods Hole, Massachusetts, to use electron microscope there. There he met Hugh Huxley and Hanson with whom he shared data and information on their works. They parted with an agreement that they would keep in touch, and when their aim is achieved, they would publish together, if they ever "reached similar conclusions". 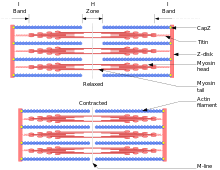 The sliding filament theory was born from two consecutive papers published on the 22 May 1954 issue of Nature under the common theme "Structural Changes in Muscle During Contraction". Though their conclusions were fundamentally similar, their underlying experimental data and propositions were different. during contraction, the actin filaments move into the A bands between the myosin filaments. the possible driving force of contraction is the actin-myosin linkages which depend on ATP hydrolysis by the myosin. In spite of strong evidences, the sliding filament theory did not gain any support for several years to come. Szent-Györgyi himself refused to believe that myosin filaments were confined to the thick filament (A band). F.O. Schmitt, whose electron microscope provided the best data, also remained sceptical of the original images. There were also immediate arguments as to the organisation of the filaments, whether the two sets (myosin and actin) of filaments were merely overlapping or continuous. It was only with the new electron microscope that Hugh Huxley confirmed the overlapping nature of the filaments in 1957. It was also from this publication that the existence of actin-myosin linkage (now called cross-bridge) was clearly shown. But he took another five years to provide evidence that the cross-bridge was a dynamic interaction between actin and myosin filaments. He obtained the actual molecular arrangement of the filaments using X-ray crystallography by teaming up with Kenneth Holmes, who was trained by Rosalind Franklin, in 1965. It was only after a conference in 1972 at Cold Spring Harbor Laboratory, where the theory and its evidences were deliberated, that it became generally accepted. At the conference, as Koscak Maruyama later recalled, Hanson had to answer the criticisms by shouting, "I know I cannot explain the mechanism yet, but the sliding is a fact." The factual proofs came in the early 1980s when it could be demonstrated the actual sliding motion using novel sophisticated tools by different researchers. With substantial evidence, Hugh Huxley formally proposed the mechanism for sliding filament and is variously called swinging cross-bridge model, cross-bridge theory or cross-bridge model. (He himself preferred the name "swinging crossbridge model", because, as he recalled, "it [the discovery] was, after all, the 1960s".) He published his theory in the 20 June 1969 issue of Science under the title "The Mechanism of Muscular Contraction". According to his theory, filament sliding occurs by cyclic attachment and detachment of myosin on actin filaments. Contraction occurs when the myosin pulls the actin filament towards the centre of the A band, detaches from actin and creates a force (stroke) to bind to the next actin molecule. This idea was subsequently proven in detail, and is more appropriately known as the cross-bridge cycle. ^ a b c Huxley, Hugh E. (2004). "Fifty years of muscle and the sliding filament hypothesis". European Journal of Biochemistry. 271 (8): 1403–1415. doi:10.1111/j.1432-1033.2004.04044.x. PMID 15066167. ^ a b c Andersen, O. S. (2004). "50-Year Anniversary of Sliding Filament". The Journal of General Physiology. 123 (6): 629. doi:10.1085/jgp.200409079. PMC 2234570. ^ a b Huxley, A.F. ; Niedergerke, R. (1954). "Interference microscopy of living muscle fibres". Nature. 173 (4412): 971–973. doi:10.1038/173971a0. PMID 13165697. ^ Rall, Jack A. (2014). Mechanism of Muscular Contraction. New York: Springer Science+Business Media. pp. 21–23. doi:10.1007/978-1-4939-2007-5. ISBN 978-1-4939-2006-8. ^ Wood, A.W. (2012). Physiology, Biophysics, and Biomedical Engineering. Taylor & Francis. pp. 158–162. ISBN 978-1-46-655279-1. ^ Hartman, M. A.; Spudich, J. A. (2012). "The myosin superfamily at a glance". Journal of Cell Science. 125 (7): 1627–1632. doi:10.1242/jcs.094300. PMC 3346823. PMID 22566666. ^ Engelhartd, W. A.; Ljubimowa, M. N. (1939). "Myosine and Adenosinetriphosphatase". Nature. 144 (3650): 668–669. doi:10.1038/144668b0. ^ Szent-Györgyi, Albert (1963). "Lost in the twentieth century". Annual Review of Biochemistry. 32 (1): 1–15. doi:10.1146/annurev.bi.32.070163.000245. PMID 14140702. ^ Szent-Gyorgyi, A. G. (2004). "The early history of the biochemistry of muscle contraction". The Journal of General Physiology. 123 (6): 631–641. doi:10.1085/jgp.200409091. PMC 2234565. PMID 15173217. ^ Szent-Györgyi, A (1949). "Free-energy relations and contraction of actomyosin". The Biological Bulletin. 96 (2): 140–161. doi:10.2307/1538196. JSTOR 1538196. PMID 18120626. ^ Rall, Jack A. (2014). Mechanism of Muscular Contraction. p. 23. ^ Hanson, Jean; Huxley, Hugh E. (1953). "Structural basis of the cross-striations in muscle". Nature. 172 (4377): 530–532. doi:10.1038/172530b0. PMID 13099257. ^ Huxley, HE (1953). "Electron microscope studies of the organisation of the filaments in striated muscle". Biochimica et Biophysica Acta. 12 (3): 387–394. doi:10.1016/0006-3002(53)90156-5. PMID 13115446. ^ a b Huxley, H. E. (1996). "A personal view of muscle and motility mechanisms". Annual Review of Physiology. 58 (1): 1–19. doi:10.1146/annurev.ph.58.030196.000245. PMID 8815787. ^ Goldman, Yale E.; Franzini-Armstrong, Clara; Armstrong, Clay M. (2012). "Andrew Fielding Huxley (1917–2012)". Nature. 486 (7404): 474. Bibcode:2012Natur.486..474G. doi:10.1038/486474a. PMID 22739307. ^ Rall, Jack A. (2014). Mechanism of Muscular Contraction. pp. 30–33, 41. ^ Huxley, AF (1986). "Discoveries on muscle: observation, theory, and experiment". British Medical Journal. 293 (6539): 115–117. doi:10.1136/bmj.293.6539.115. PMC 1340847. PMID 3089413. ^ Huxley, H.; Hanson, J. (1954). "Changes in the cross-striations of muscle during contraction and stretch and their structural interpretation". Nature. 173 (4412): 973–976. doi:10.1038/173973a0. PMID 13165698. ^ Spudich, J. (2013). "Memories of Hugh E. Huxley (1924-2013)". Molecular Biology of the Cell. 24 (18): 2769–2771. doi:10.1091/mbc.E13-08-0454. PMC 3771940. PMID 24030511. ^ Huxley, Hugh E. (2008). "Memories of early work on muscle contraction and regulation in the 1950's and 1960's". Biochemical and Biophysical Research Communications. 369 (1): 34–42. doi:10.1016/j.bbrc.2007.11.130. PMID 18070595. ^ Huxley, HE (1957). "The double array of filaments in cross-striated muscle". The Journal of Biophysical and Biochemical Cytology. 3 (5): 631–648. doi:10.1083/jcb.3.5.631. PMC 2224118. PMID 13475381. ^ Huxley, HE (1963). "Electron microscope studies on the structure of natural and synthetic protein filaments from striated muscle". Journal of Molecular Biology. 7 (3): 281–308. doi:10.1016/s0022-2836(63)80008-x. PMID 14064165. ^ Huxley, H. E.; Brown, W.; Holmes, K. C. (1965). "Constancy of axial spacings in frog sartorius muscle during contraction". Nature. 206 (4991): 1358. doi:10.1038/2061358a0. PMID 5838248. ^ Cooke, R. (2004). "The sliding filament model: 1972-2004". The Journal of General Physiology. 123 (6): 643–656. doi:10.1085/jgp.200409089. PMC 2234572. PMID 15173218. ^ Maruyama, K (1995). "Birth of the sliding filament concept in muscle contraction". Journal of Biochemistry. 117 (1): 1–6. doi:10.1093/oxfordjournals.jbchem.a124692. PMID 7775372. ^ Geeves, Michael A. (2002). "Stretching the lever-arm theory". Nature. 415 (6868): 129–131. doi:10.1038/415129a. PMID 11805818. ^ Spudich, JA (1989). "In pursuit of myosin function". Cell Regulation. 1 (1): 1–11. doi:10.1091/mbc.1.1.1. PMC 361420. PMID 2519609. ^ Yanagida, Toshio; Arata, Toshiaki; Oosawa, Fumio (1985). "Sliding distance of actin filament induced by a myosin crossbridge during one ATP hydrolysis cycle". Nature. 316 (6026): 366–369. doi:10.1038/316366a0. PMID 4022127. ^ Duke, T. A. J. (1999). "Molecular model of muscle contraction". Proceedings of the National Academy of Sciences. 96 (6): 2770–2775. doi:10.1073/pnas.96.6.2770. PMC 15844. PMID 10077586. ^ Huxley, H. E. (1969). "The Mechanism of Muscular Contraction". Science. 164 (3886): 1356–1366. doi:10.1126/science.164.3886.1356. PMID 4181952. ^ Spudich, James A. (2001). "The myosin swinging cross-bridge model". Nature Reviews Molecular Cell Biology. 2 (5): 387–392. doi:10.1038/35073086. PMID 11331913. ^ Fitts, R. H. (2007). "The cross-bridge cycle and skeletal muscle fatigue". Journal of Applied Physiology. 104 (2): 551–558. CiteSeerX 10.1.1.569.8211. doi:10.1152/japplphysiol.01200.2007. PMID 18162480. This page was last edited on 25 March 2019, at 23:43 (UTC).